Welcome to the first Circle of fifths lesson. Below is a Circle of 5ths diagram, with an explanation of how it is structured, and what the diagram labels mean. This lesson should be read before the other 4 lessons that explain the major / minor sharps and flats in detail. Learning how to draw this diagram quickly from memory is one of the most useful things to do in mastering music theory. It will save hours learning the notes in each major and minor scale individually, and provides insight into the naturally occuring intervals and relationships between musical scales. 1. Circle of fifths - why is it useful ? This lesson shows a Circle of fifths diagram, explains what it represents, and why it is a useful thing to learn and memorize. Using the system described in the remainder of these lessons (lessons 2, 3, 4 and 5), when drawing the diagram from a blank sheet of paper, it is easy to work out which notes are in every scale shown in the diagram. ie. which scales have sharps or flats, their note names, and how many sharps and flats there are in each scale. By following the system below, you will not need to know in advance which notes are in which scales before you draw the diagram - all note names will naturally fall out as part of the process of drawing the diagram. It is arguably much easier to learn to draw this single diagram than calculating and memorizing the notes in all 30 scales individually (and manually). For an example on how to construct a scale manually, have a look at any major scale eg. Gb major scale, which shows the process of arriving at the note names by using tone-semitone intervals, then deciding the note names. It is not always straightforward, especially when certain white notes need to be sharpened or flattened and renamed completely. Not only does the Circle of 5ths show all the most useful scales, but it shows which scales sound similar to each other. It groups together different scales which differ only by one note name (a sharp or a flat), and it also groups together those scales where a major and minor scale actually contain the same note names. It also groups together scales which have different names eg. F-sharp major and G-flat major, which contain different note names, but the note pitches ie. note sounds are identical. This is useful when composing music and being able to quickly identify which chords and scales sound good together. This system for drawing the Circle of fifths uses easy-to-remember phrases / facts to show the placement of the scale names, so the diagram can be drawn without knowing anything about musical theory (scales etc.) beforehand. This is useful to get the diagram completed, but it is not a very musical way of understanding the relationships between scales grouped together on the diagram. So as part of the process of drawing the diagram, this system will describe the musical intervals that underpin all the circle of fifths relationships - specifically the importance of the 3rd, 4th, 5th and 6th scale notes as entrypoints into related and similar scales. The Circle of fifths diagram below shows the major and minor scale names, including a table at the bottom showing the sharp and flat notes in each scale (highlighted with yellow bullets). It might be useful to save it and print it off the diagram for reference. The rest of the Introduction below explains the diagram structure in detail. The Circle of fifths shows the most common and popular major and minor scales to use for composing music. Every scale on this diagram contains notes having only single sharps and flats.. never double-sharps or flats, which are messier to work with. In contrast, other scales do exist in theory (called theoretical scales), but these are just identical scales to those already on the Circle of fifths diagram, but with different scale names, and with double-sharps or flats - much more complex to work with. As a specific example, have a look at the key signature of the A# major scale, which has 3 double-sharps plus 4 Single sharps(! ), and then have a look at the construction of the Bb major scale, which has just 2 flats. Then have a look at Step 3 of both these pages - showing the tone / semitone intervals and starting note, and it is clear that although both of these scales contain different note names, they use exactly the same note pitches. ie. the same physical piano keys are pressed in both scales. This means that given a choice, the B-flat major scale would be used in preference to A-sharp to describe a set of note pitches on a musical staff. From a music theory perspective, Scales A-sharp and B-flat are said to be enharmonic to each other, as they contain the same note pitches. The harmonic minor and melodic minor scales, both derived from the natural minor scales are not shown on the diagram. The Circle of 5ths diagram above is based on the Wikipedia version by Just plain Bill, except that it is shown as a spiral, with the sharps and flats clearly separated out at the 5, 6 and 7 o'clock positions, where the spiral arms overlap. Even though the circle is shown as a spiral, the idea of it being a clock with 12 hour positions still holds. The letter names in red refer to major scales, so at 12 o'clock, the C note means the C major scale. The letter names in green refer to minor scales, so at 12 o'clock, the A note means the A natural minor scale. The minor scales are shown in lower case just to clearly separate them out from the major scales - normally the A minor scale would be abbreviated to Am, but the m is left off to keep it uncluttered. So for example, at 9 o'clock two scales are shown - Eb major scale (red), and the C natural minor scale (green). An example where the spiral arms overlap is at 5 o'clock, which has 4 scales at this hour position: Cb major scale and the B major scale (both red), and the Ab natural minor scale and G# natural minor scale (in green). Every spiral position (black dot) contains black text saying how many sharps or flats the red major and green minor scales have around it. For example, at 4 o'clock, it says that the E major scale and the C# natural minor scale both contain 4 sharps. Importantly, from a music theory perspective, both of these scales contain the same note names, and so the only difference between them is that they start on a different note, the (tonic, or starting note). For example, E major starts on note E, and C-sharp minor starts on note C#, but both scales contain the notes E, F-sharp, G-sharp, A, B, C-sharp, and D-sharp, but in a different order. This relationship is called the related minor (or relative minor). As an example, have a look at the E relative minor page. The C# major scale and A# natural minor scale both have all notes sharpened (7 in total), and they begin on the inner arm of the spiral, at 7 o'clock, and then moving counter-clockwise (7, 6, 5 etc. ), the number of sharps decreases by one each time until C major scale and A natural minor scale at 12 o'clock, which both have no sharps or flats. 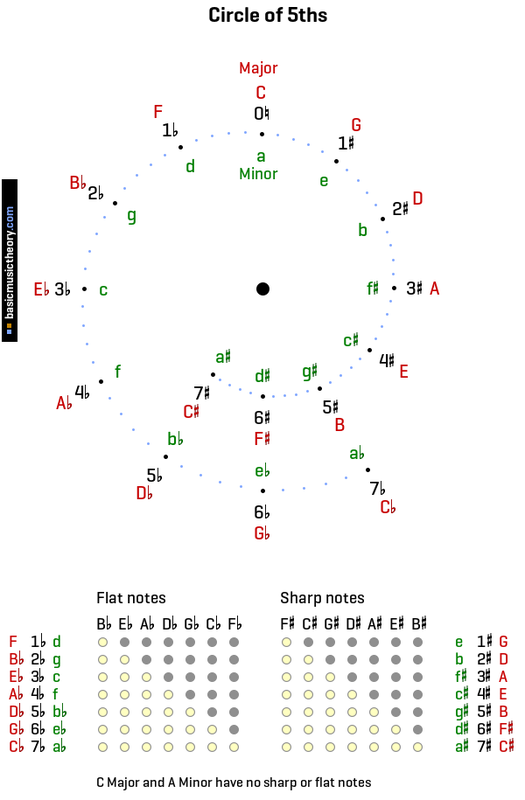 At 12 o'clock, C major and A minor are unique cases in being the only scales on the Circle of 5ths diagram that have no sharps or flats.. only white keys are used to play them. They are shown with a natural symbol next to the zero to indicate no sharps or flats. Then continuing counter-clockwise from C major, the number of flats starts increasing from 1 to the end of the outer arm of the spiral at 5 o'clock, whose scales Cb major scale and Ab natural minor scale have all 7 notes in the scale flattened. Every hour position contains scales which are 1 sharp or 1 flat , ie. one note different from the previous and next hours. This arrangement is useful, because scales that are similar to each other, and chords based on those scales also sound good together. For example the C, F and G major chords (hour positions 12,11,1) sound great together, and this progression is used a lot in pop music. The scales at the same hour position (the relative minor) are also important in identifying similar scales. So extending the chords sequence given just slightly, it is no coincidence that the C, Am, F and G is another very popular pop chord progression. The further around the circle relative to a given hour, the fewer notes there will be in common, and so the more awkward or dissonant the chords will sound together. For example, scale D and A-flat (8 o'clock) would struggle to sound good when played next to each other. The example above uses major scales, but obviously the same principle applies to the minor scales, who are separated by one note for each hour position. For any given point on the spiral, the major/related minor scales contain the same note names, but arranged in a different order. So on the outer arm, we can say that at 6 o'clock, Gb major scale has the same note names as Eb natural minor scale, and on the inner arm, F# major scale has the same note names as D# natural minor scale. So what is the significance of the spiral arms overlapping in this way, so far as the scales notes are concerned? Looking at the two major scales at 6 o'clock, we see the note names F# and Gb. These are really different note names for the same physical black key on the piano, and so a major scale built starting from that physical piano key will have the same note pitches/sounds, regardless of whether that tonic/starting note is called F-sharp or G-flat. So it turns out that these scales have identical note pitches/sounds, and only differ by the note names used by each. F# major scale uses 6 sharp names, and Gb major scale uses 6 flat names, but they sound identical, as the Tone-Tone-Semitone-Tone-Tone-Tone-Semitone intervals used to construct this scale remain the same whether we choose to call the first note in the scale F-sharp or G-flat. To see this in action, compare how F-sharp and G-flat are constructed, and you can see that steps 1 to 3 on these pages are identical in terms of which white and black piano keys are used to decide the 7 notes in the scale. Steps 4 onwards are different, where the note names are decided as being sharp or flat. This property of having two note names for the same note pitch is called enharmonic, and in music theory terms, we would say that the F-sharp scale is enharmonic to the G-flat scale. Either scale could be used to represent the note pitches you can play and hear. The same applies to the two minor scales at 6 o'clock - D# natural minor scale and Eb natural minor scale are enharmonic to each other, with the same note pitches/sounds, but different note names. That concludes the music theory needed for the remaining 4 lessons. These lessons will each take a portion of the Circle of fifths diagram, draw in the scale names, and then work out the notes in each scale. To continue, click on the 2. Major sharps link below.